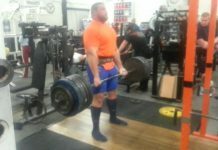 A continuingly slimmer Terry Hollands continues to post up videos of his strongman training, despite his self-proclaimed uncertainty as to whether he’ll go for World’s Strongest Man 2013. His definitely taking a new approach to his training – flying in the face of the mass monsters that have dominated strongman as of late. Perhaps he was encouraged by Lalas’ recent performances, proving that you don’t need to be a 10ft, 20 tonne beast to reach the podium. 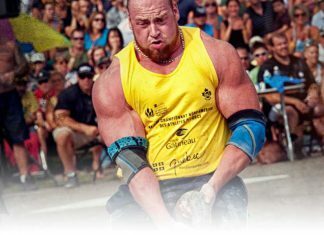 Here’s Terry doing his first stone run following the bicep injury he suffered during WSM 2012. 110kg – 177kg atlas stones, all looking rather comfortable! Misha does a 120kg… situp? !